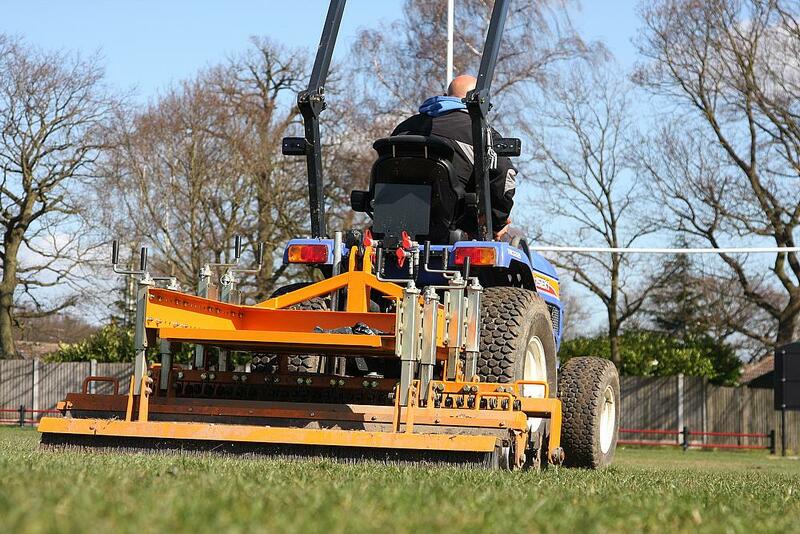 The turf maintenance equipment, along with a compact tractor, was purchased as part of RFU head groundsman Keith Kent’s pitch maintenance equipment package, and made possible through an RFU ‘Get Fit for Rugby World Cup 2015’ grant to help to deliver a high quality pitch maintenance programme for the club. The RFU grant came at the perfect time for the club and the new partnership that they were entering with the council. The grant monies was also further subsidised by a grant from the Ford Britain Trust which further offset the cost of machinery to the club. The 1.8 metre wide SISIS Quadraplay is a versatile pitch maintenance system which connects to any tractor with a 3-point-linkage. The system includes a mounted frame with four implements which can be arranged in any order and can be lifted out of use when not required. A single pass allows up to four operations to be carried out simultaneously including surface aeration, sward cleansing, rolling and brushing, which when combined together, enable groundsman to prepare and maintain a pitch to the desired standard as well as looking aesthetically pleasing. Future plans for the club include full drainage works of their training pitch with the help of a grant from Sport England later this summer. “Once completed, we will use the maintenance equipment on the new surface – maintaining it to a far greater standard than we were previously able to,” said club chairman Richard King. Comments echoed by Steve Killington, director of rugby: “The pitch maintenance equipment is so important to us. Since we’ve had it, we’ve only had to postpone one first team game this season - despite the weather, where many other clubs in the area were postponing games for the whole of January and February and that’s largely down to the SISIS maintenance equipment. It kept revenue coming into the club, which has made a big difference for us.